Maximize your square footage. See ways to creatively add style, comfort and function to small space dining rooms. 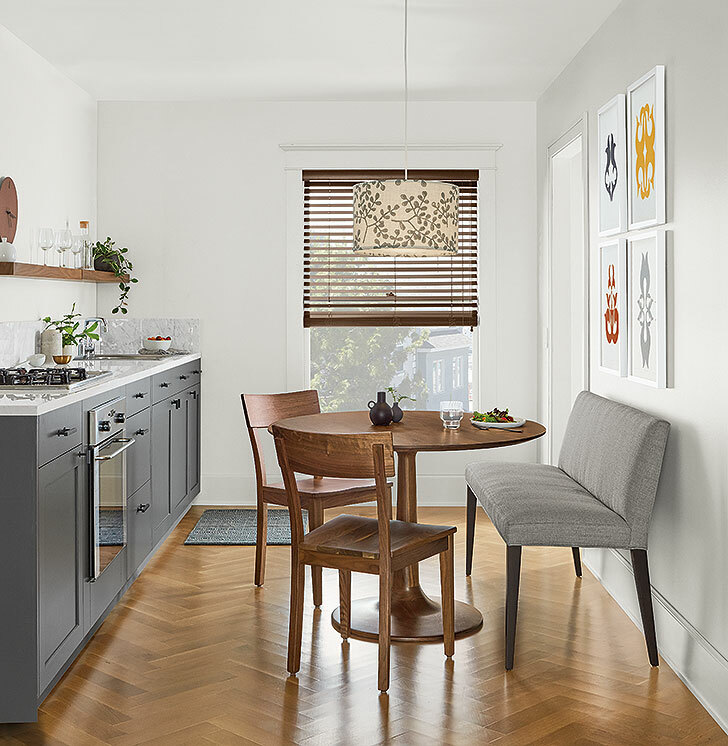 These four small space dining ideas are big in style while maintaining a minimal footprint. Perfect for narrow spaces, the Julian table maximizes surface area with its oval shape. Plus, the Adrian cabinet can store anything from glasses and dishes to board games and linens. It’s the perfect multi-use storage solution for a small room. 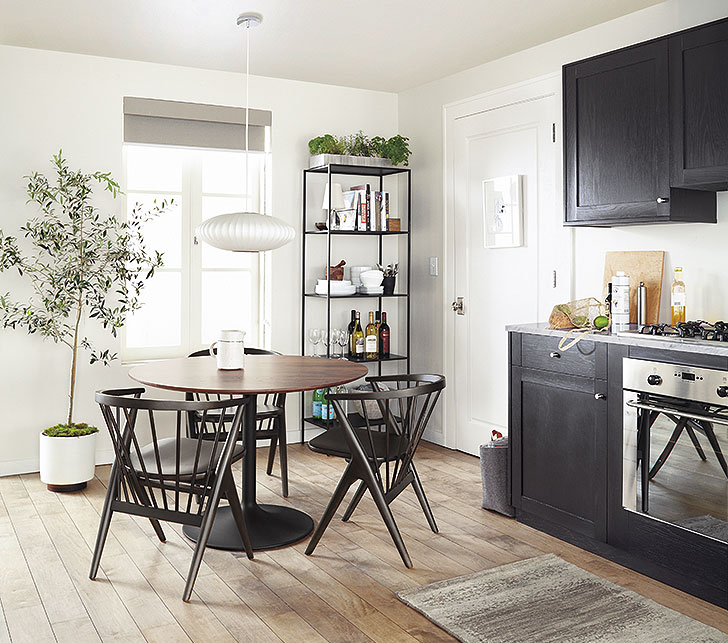 For this eat-in kitchen, the Madison table is the perfect scale. A pedestal base helps save space, while the walnut adds natural warmth. Also, a bench is a smart solution for small spaces as it easily seats additional guests. Simply place it against the wall to save square footage and enjoy its multiple uses throughout your home. Just right for small spaces, our Benson table is big on architectural style. 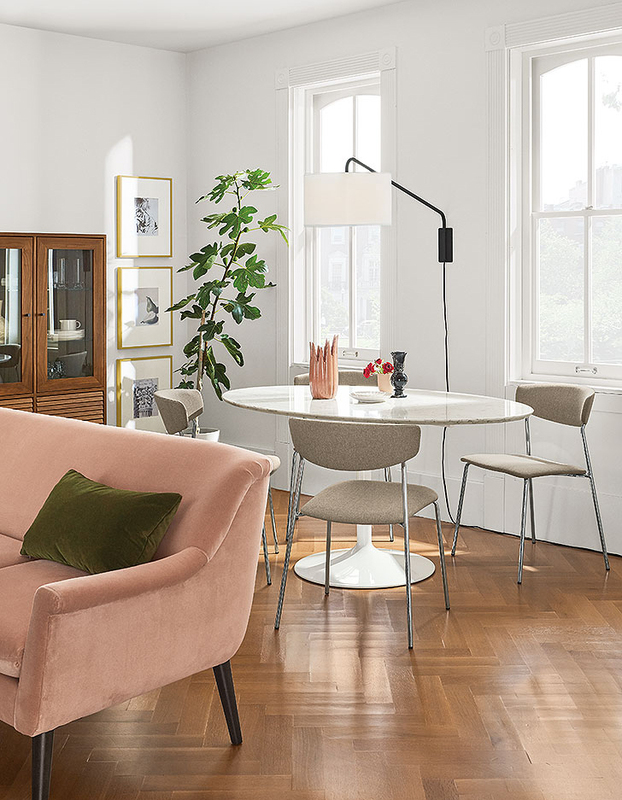 Perfectly scaled for this dining space, Benson’s circular table top makes it easy to add or remove chairs. Our Hirsch chair packs comfort and style in a timeless, compact design and complements the small scale of the table. A round table for three like the Aria dining table fits perfectly in this smaller space. It rounds out the room nicely without being overbearing. We love the idea of displaying cookbooks, favorite wines or foodie accessories on an open bookcase (like Slim) for a fresh dining room look. It helps keep the room open, while providing much needed storage space. Wanting more inspiration? Check out additional small space solutions on our website. Which Extension Table is Right for You?